This post is a Step by Step Guide to deploy Visio 2013 using SCCM. In my previous posts we have seen office 2010 , office 2013 and office 2016 deployment using Configuration Manager. This post explains how to deploy Visio 2013 using SCCM. Visio 2013 for Windows is available in two editions: Standard and Professional. The Standard and Professional editions share the same interface, but the Premium edition has additional templates for more advanced diagrams and layouts, as well as capabilities intended to make it easy for users to connect their diagrams to data sources and to display their data graphically. In this example, I have got Visio 2013 Standard edition (32-bit) with me as part of a volume licensing agreement. Deployment Info – If you want to customize the Visio 2013 and then deploy it then you could run ‘setup.exe /admin’ that will launch the Office Customization Tool. At the end it creates a MSP file that you can later use by running ‘setup.exe /adminfile file.MSP’. If you are new and have no idea about using OCT for Office 2013, it is shown here. You can also use the Config.xml file to configure installation tasks and use it only when you run Setup. Config.xml is not installed or cached on users computers. Administrators can edit the Config.xml file to customize the installation. By default, the Config.xml file that is stored in the core product folder, core_product_folder_name.WW, directs Setup to install that product. Note – If 64-bit version of Office is installed on a computer, you cannot install office 32-bit version of Visio. And if 32-bit version of Office is installed on a computer, you cannot install 64-bit version of Visio. You could read choose between the 32-bit and 64-bit versions of Office. Launch the Configuration Manager console and navigate to Software Library > Overview > Application Management > Applications. Right click on Applications and click Create Application. Click on Manually specify the application information. Click Next. On the General Information dialog, specify the Name of the app and some more details. Click Next. In the Deployment Types dialog, click on Add. This will open up a new window. On the General page, click on Manually specify the deployment type information. Click Next. Specify a name for the deployment type. Click Next. Provide the path where the Visio setup files are located. Here is the example of config.xml that I used during the deployment. For detection method, click on Add Clause and choose the Setting Type as Windows Installer. Enter the product code and select the option “This MSI product code must exist on the target system and the following condition must be met to indicate presence of this application“. On the User Experience dialog, specify the Install behavior, Logon requirement and program visibility to the settings shown in the below screenshot. Click Next. Complete the rest of steps by clicking Next. On the completion dialog, click Close. Once you application is ready, right click on the application and click distribute content. Choose the distribution point(s) where you want to the content to be distributed. Once the content is available with the distribution point, deploy the application to the collection. You could deploy the app as available or deploy it as required. Launch the software center on the client computer. 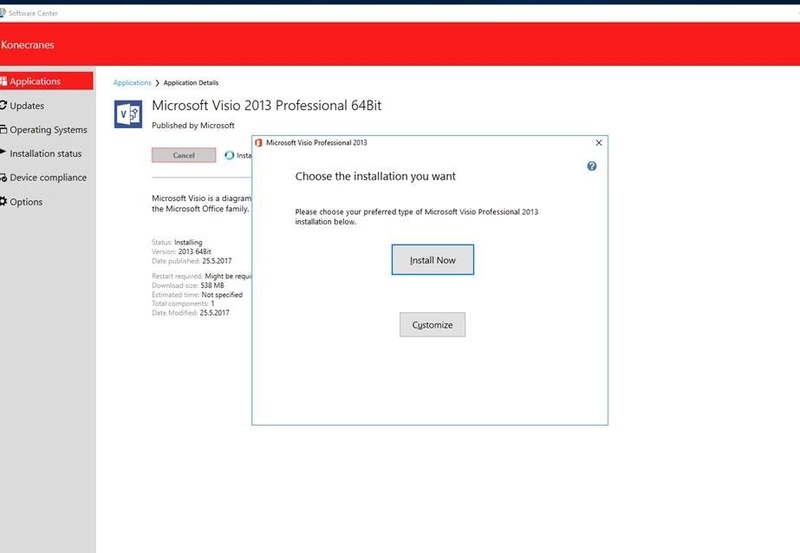 Select the Visio app and click Install Selected. We now see the Visio app is installed successfully. If you encounter any issues with the application install, open the AppEnforce.log file to see more details. Hi Prajwal, please post a guide on how to install Visio and Project 2016. Can you help at all? I am having a problem with trying to suppress the “Choose the installation you want” window display. I want it to not show, only confirm when the installation is complete. In the Office customization tool (msp settngs) I have the display level as “None” and “Completion notice” ticked but still when Visio installs the window shows the “Install” and “Customize”. I want this not to show and only install without any more user input. Would I need to use an xml for this or are there other options that I haven’t yet found? is there guide deploy visio 2016? Not yet, but i will post it soon. Please do Prajwal I’m pulling my hair out with Visio and Project 2016 deployments via SCCM (the detection method and uninstall strings). Thanks a lot! James.